McClain suffered a fumble on a kickoff return during an Frontier Athletic Conference game against the Washington Blue Lions at McClain High School Friday, Oct. 13, 2017. The fumble was eventually recovered by No. 19, Alex Hamrick. For the Blue Lions (l-r); George Reno (1), Hamrick (19), Collier Brown (25), Trenton Henize (30), Jeremy Sluder (45), Caleb Rice (4) and Garitt Leisure (11). GREENFIELD — The Washington Blue Lions visited McClain High School Friday night for a renewal of one of the oldest high school sports rivalries in Ohio. The match-up this time was the two teams’ first meeting as members of the new Frontier Athletic Conference. On a beautiful autumn evening, the Blue Lions rolled to a 48-10 win over the Tigers. Washington improves to 4-4 on the season, 2-1 in the FAC. McClain falls to 0-8 overall, 0-3 in the FAC. The Blue Lions welcomed the return of quarterback Dillon Steward and he drew the start and played, as did most of the first team, for three quarters of the game. Washington had a 41-0 halftime lead, which set in motion the continuous clock at McClain. The Blue Lions scored three times in the first quarter and thrice again in the second quarter to build that insurmountable lead. McClain broke a two-game scoreless streak with a 39-yard field goal by Camden Yates with 3:54 to play in the third quarter. McClain’s Justin Osborne completed a pass to Richie Everhart for a 33-yard touchdown with 7:34 to play in the game. Yates had the extra-point kick. For the Blue Lions, Steward carried the ball 11 times for 251 yards and two touchdowns (runs of 41 and 60 yards). The scoring began with Steward passed to Richie Burns for a 27-yard touchdown at the 7:39 mark. Jordan Behm made the conversion kick, one of three different kickers to score for Washington on this night. With 3:41 to play in the first quarter, Steward carried for the above-mentioned 41-yard touchdown. This time, Nick Bishop connected for the extra-point. Washington scored twice in the game with no time remaining on the clock. As time expired to end the first quarter, Steward completed a pass to Caleb Rice for a 16-yard touchdown. The extra-point attempt was no good, leaving Washington with a 20-0 lead. With 9:06 to play in the first half Steward hit Eli Ruth for a 24-yard touchdown. Jaelyn Mason made the first of her three extra-point attempts in the game. With 1:50 to play in the half, Steward found Eli Lynch for a 13-yard touchdown. Mason’s kick made it 34-0, Blue Lions. It appeared that would be the score at the half, but on the final play of the half, Steward broke to the outside and raced down the visitor’s sideline for a 60-yard score. Mason’s PAT made it 41-0 at the half. The Tigers got their field goal, then Washington’s Jameson McCane scored on a five-yard run. The extra-point kick by Mason made it 48-3 with 1:31 remaining in the third. McClain finished the scoring with the aforementioned strike from Osborne to Everhart. “Richie did a great job for us (at quarterback),” Washington head coach Chuck Williamson said. “But Dillon went through the spring and summer (at quarterback). He has a really good grasp of what we’re trying to do, offensively. Taking a look at a few statistics, Washington had 521 yards of offense to 234 for the Tigers. Washington had 200 yards passing on 14 of 22 attempts, Steward and Tyris Virts combined (Virts was 4 of 4 for 41 yards. Steward had four touchdowns and threw one interception. For McClain, Justin Osborne was 11 of 25 for 130 yards, one touchdown and two interceptions, one by Zane Nelson and the other by Kolton Jackson. Washington carried the ball 26 times for 321 yards to 92 yards on 33 carries for the Tigers. Washington is back at home at Gardner Park next week to take on Chillicothe. McClain will travel to Jackson next Friday. 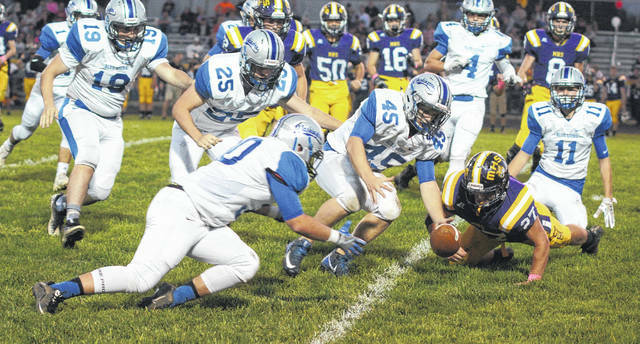 Jackson defeated Hillsboro last night, 28-6.
https://www.recordherald.com/wp-content/uploads/sites/27/2017/10/web1_Blue-Lions-recover-fumble.jpgMcClain suffered a fumble on a kickoff return during an Frontier Athletic Conference game against the Washington Blue Lions at McClain High School Friday, Oct. 13, 2017. The fumble was eventually recovered by No. 19, Alex Hamrick. For the Blue Lions (l-r); George Reno (1), Hamrick (19), Collier Brown (25), Trenton Henize (30), Jeremy Sluder (45), Caleb Rice (4) and Garitt Leisure (11).